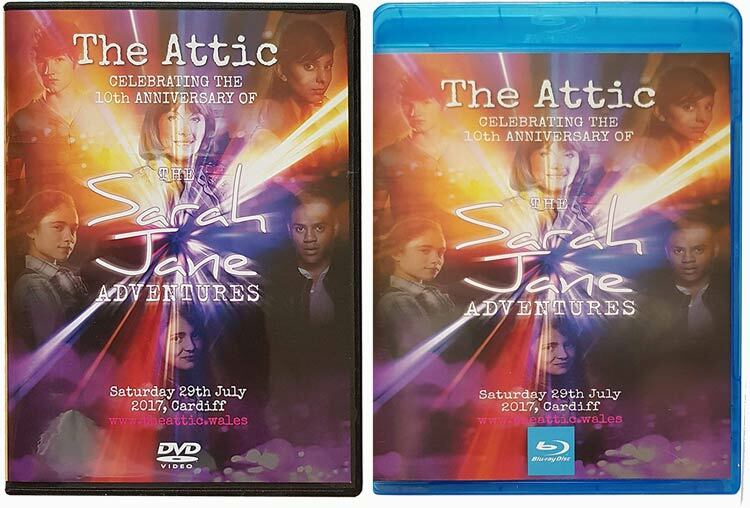 The Attic was a reunion of the cast & crew of The Sarah Jane Adventures to celebrate the shows 10th anniversary. It raised over £6000 for Ty Hafan children’s hospice based in Penarth near to where the show was filmed. A portion of this sale will be donated to Ty Hafan! Guests on the day included: Tommy Knight (Luke Smith) Anjli Mohindra (Rani) Yasmin Paige (Maria Jackson) Sinead Michael (Sky) Mina Anwar (Gita) Katy Manning (Jo Grant/Jones) Paul Marc Davis (The Trickster) Phil Ford & Joe Lidster (Writers) Gary Russell (Script Editor) Sam Watts (Composer) John Leeson & Mat Irvine (K9) Scott Handcock (Runner) Richard Wisker (George in ‘Lost in Time’) Brian Miller (Elisabeth Sladen’s husband) The event was hosted by CBBC presenter Chris Johnson and Scott Handcock of Dr Who Big Finish fame. It was supported before and on the day by popular YouTubers Tom Dix (Epic Who) and Zack Attree. Available in 1080p this Bluray has a running time over over 7 HOURS and features the complete stage panels from the day filmed in superb quality from the very front with unobstructed views and direct feed from the microphones used. Aside from reuniting the cast the panels cover a range of on and off screen memories, the careers of the cast, memories of Elisabeth Sladen, the music of the show, writing and producing the episodes etc. (NOTE – Special features are Standard Definition quality not HD) During the day members of the cast took part in a special version of ‘The Gameathon’, previously used a couple of times by the CBBC Sarah Jane Adventures website. For those who don’t remember the original it’s essentially a ‘sports day, activity, challenge’ event. It included all sorts from sack and space hopper races to maths challenges and isn’t to be missed! This event and the Bluray is unofficial and not endorsed or supported by the BBC. & The Wedding of sarah jane smith 2009. This sounds cool but it’s kind of annoying the blu ray is £10 more expensive than the DVD.